Over the next year, AC Transit will be reviewing all of its policies regarding service deployment-where and how we provide bus service. Additional policies, such as Environmental, Civil Rights and Public Hearing Policies direct the process of adopting new service. 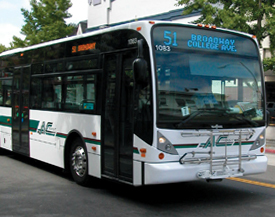 AC Transit will be reviewing policies in all these areas, with the goal of bringing them current with new developments in transit design and technology. Below are links to memoranda pertaining to The Transit Capacity and Quality of Service Manual published by the Transportation Research Board which set out the latest industry and academic thinking on transit service deployment and quality. There is also a link to the memorandum outlining the work plan for the Planning Committee’s review of service policies. We welcome and invite you to observe and comment. If you would like to be notified via e-mail when updates are posted, please contact the District Secretary, Linda Nemeroff (lnemeroff@actransit.org) or at (510) 891-7284.